Today's project was a lot of fun. The donation that I mailed back on Day 3 was for Christmas food boxes, to be distributed by the South Plains Food Bank. As I mentioned in that post, these come at an important time for many families. If their children are on meal programs at school, they will at least receive breakfast and lunch each day, but when school lets out for the holidays, there's no help. These boxes contain about enough food to feed a family for a week. Today was distribution day. Blake and I showed up at the food bank at 8:30. I'd told him where we were heading, and he was really excited, because his school had done a big food drive a few weeks earlier, and now he was going to see where all of that food had gone. There were two main areas for volunteers to work, distributing boxes outside to cars as they drove through, or filling sacks with produce and fresh goods inside. There were plenty of people outside, so Blake and I headed back to the dock where the sacks were going to be filled. There were pallets and pallets and cartons and boxes, all filled with different fresh goods. Lots of different fruits and vegetables, cheese, bread, and potatoes. Our job was to take brown paper grocery sacks and fill them to the very top with an assortment of goods. When we started, there were only about five of us there, so it was kind of slow going. More volunteers began to come, though, and we built a pretty efficient assembly line process, filling bags within a few seconds. The bags were getting filled more quickly, but this actually introduced a few new hitches. First, Blake (and his friend from church, Jackson) was starting to get restless, because he wasn't really a part of the assembly line. Second, empty boxes were starting to pile up. Third, the speed of assembly meant that the bagging area quickly ran out of goods to bag. "Hey boys, come here. I have an important job for you. See all of these empty boxes? They need to be broken down, flattened out, and thrown into that box so they can go to the baler. Can you do that?" And that's what they did for the rest of the time we were there, and they had a blast doing it, because I showed them how they could put them upside down and stomp on them to break the seams. When the box holding them got too full, I'd lift them in there to stomp them down, which they thought was hilarious. While the boys broke and stomped boxes, I kept busy doing resupplying. As one part of the sacking area would begin to run out of things, I'd bring over more goods to fill it with. We'd keep getting to the bottom of one stack of things, only to discover something entirely different underneath it. It was great! I kept thinking of the family who would enjoy the cartons of strawberries we'd just found, or imagining the salsa that somebody might make with the tomatoes, onions, and jalapenos that we put in a bag together. My mom kept Jack and Ava while Blake and I were at the food bank, and when I got to her house, they were in the back yard with her, helping pick up the last of the leaves that had fallen after Lubbock's snow earlier this month. They got their service for the day in, too! 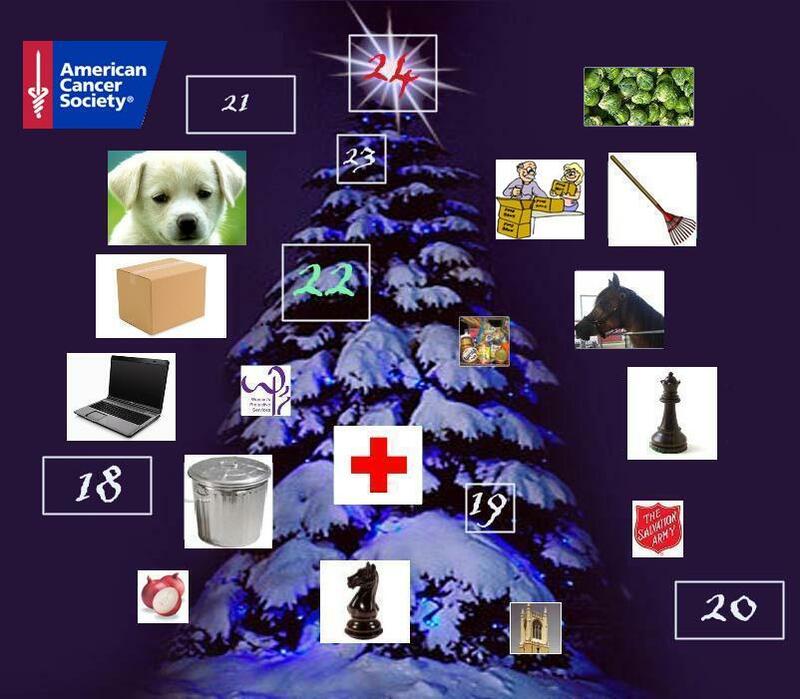 There's just one week left in Project Advent. I didn't stack it this way on purpose, but I have some things coming up this week that I'm very eagerly anticipating. I'm looking forward to sharing them with you. Gratitude Project: I was shopping today for Monday's project, and ran into one of my favorite teachers of all time, Ms. Sara Duncan. Anybody else who went to LHS will probably feel the same way, although I imagine every school has "that" teacher. I had the nicest talk with her, and was so proud to introduce her to Jack, who was with me, and who acted like a true gentleman for once. Although Ms. Duncan was one of the standouts, I was blessed to have many superlative teachers during my education, and I'm so thankful for what they gave to me. Oh, Dan! How awesome of a gratitude thought today! She was an amazing teacher. I sometimes think teaching K-12 is, in and of itself, a service to society. I've told my brother that when we help our students who are in need financially or work through tough years with students who have to be taught how to be kind and a good citizen, we truly are doing the Lord's work.